They are thus the Internet equivalent of the American phone system not using the exchange 555, only more useful. If you need to give an example IP address, you can use one of those without causing anyone consternation or irritation. An example of why you want to use one of these addresses can be found (at least for the next few minutes) at Microsoft’s site for the IE 8 beta. One of the IE 8 features is the “SmartScreen Filter” which can tell you IP addresses you’re best not going to. An example is the picture accompanying my post. If you check out that address, 207.68.196.170, at ARIN Whois, you find out that it’s owned by Microsoft themselves. I suppose that using one of your own addresses as a hazardous address is better than using someone else’s, but immature people like Your Friendly Author will titter over it and point it out to other people as well. There’s a reason RFC 1918 exists, and this is one of them. Oh, by the way, be sure to look at RFC 2606, which reserves the domains example.com, example.net, and example.org. It also reserves the top-level domains .test, .example, .invalid, and .localhost. Remember them. Apropos RFC 2606, I am reminded of this story at the Washington Post! 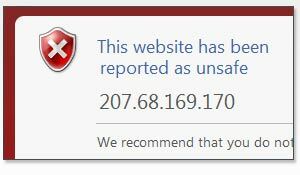 So what if IE reported 192.168.0.1 as unsafe? Lots of people use those blocks for local addressing. If IE reported one of those sites as unsafe, then there would be lots of panicing people concerned that their systems had been hacked. uh hate to tell u this but you transposed 169 in display to 196 in article.. perhaps arin should be rechecked? Lessons for security from "Social Networks"